It rained cats and dog this afternoon. Don't believe me? Here is the proof. After the rain stopped, Mamarazzi decided to go out to dispose the rubbish. And hey...what should we see...a flash that jump out of our front door grille. It was a cat. Then I saw this. A tiny kitten. So tiny that it can't move much and its eye yet to open. Omigosh! did it really rained cats and dogs? where is the doggy pulak? Mamarazzi told me not to touch the little kitten coz the Mommy Cat will come and claim the kitten later. And true enough. We closed the door and after half an hour the kitten was gone(missing..not dead). The Mommy Cat came back and claimed the kitten. eh.. how come a kitten is under yr shelf? it is outside? my back lane is full of cats and kittens too.. There was a cat given birth to few baby few months back at my back lane. I hate cat but if they stay at the back lane I will have to show some mercy by giving them some food everyday. Thanks god they are gone now. oh... poor kitten.. so kecik lagi. Joshua, ur kaki-lang! quick help!!! 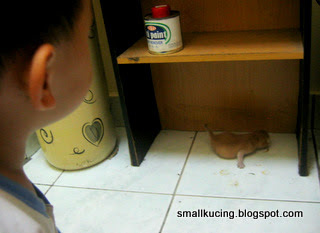 Smallkucing found a smallkucing...should let them post for a photo together.....LOL! oh gosh, i am sure the stray cat will consider this a home for herself and her kittens!!! are you giving them a shelter?? i dare not let him go near to the newborn kitten la. Scared he Cekik the kitten. Kids doesnt know their own strength. Anyway...if he touch the kitten, the mother cat might reject the poor kitten later. I guess the mother cat and kitten came in to shelter from the wind and rain. It rained very hard just now. The rain had stopped and the cats have gone. Poor little kitty. Luckily, the Mummy Cat came and claimed her baby. If Mummy Cat never come, how ah? Aiyo....luckily the mummy did not abondon the baby. Oh..poor kitty! Glad the mummy cat came to get it! Guess if the Mommy Cat dont come back...have to adopt it gua. Ya lor...lucky the Mother Cat come back. Or else have to adopt it. 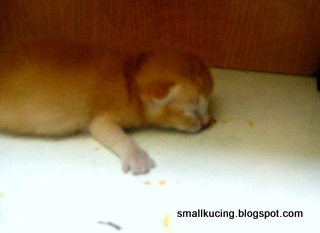 Even if adopt it dont know whether it will survive coz it dont know how to lap up milk yet. I really hope the mommy's the one which claimed the kitten. can't bare to think of anything bad. so cute but sad. It should be the real Mommy Kucing that claim it or else there would have been guts littered all over the floor. Ah! Poor kiteen!! I love cat and kitten. Eh, the kitten nose got blood ar? ?